Most Kentucky beef producers have spring-calving cow herds that graze fescue pastures which have high endophyte levels. Getting a high percentage of cows bred in May, June, and July to calve in March, April, and May can be a challenge. I personally prefer fall-calving for that reason, but I also believe that we can have successful breeding performance in the spring. There are some keys to getting a high percentage of cows pregnant for a spring calving season. The most general problem, in my opinion, is that the winter feeding program isn’t adequate to support required body condition for early rebreeding. Cows should enter the breeding season in good body condition (Body Condition Score 5) which doesn’t always follow our winter feeding programs. It seems that we sometimes try to “rough ‘em” through the winter and hope that spring grass will “straighten them out”. That is a sure formula for delayed breeding or open cows. Spring-calving cows need to conceive early in the breeding season (before late June) for best results. We conducted a trial at the UKREC (Western Kentucky) several years ago in which similar cows were separated into three breeding periods of 45-days each on high-endophyte fescue – see Table 1. Cows which were exposed to bulls from June 19 to August 4 had a pregnancy rate of only 59%. At this location, the average maximum daily temperature reaches 90°F by about June 20. This elevated temperature, coupled with the endophyte that is present in most fescue pastures, likely contributed to that decreased performance.We have also measured the alkaloid levels in high-endophyte fescue at this location. 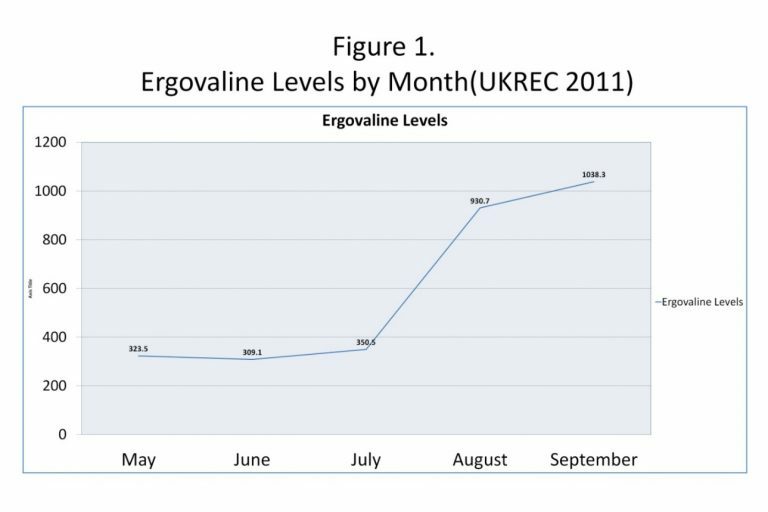 Since the primary culprit in toxicity of high endophyte pastures seems to be ergovaline, let’s look at ergovaline levels (Figure 1) across the growing season. After our July (about July 10) measurement, the ergovaline levels increased dramatically. So this toxicity, coupled with high temperatures, appears to mean that breeding will not occur at acceptable rates in July, August and September. Therefore, cows need to be pregnant by the end of June for best results.Ergovaline levels differed greatly by pasture, too (see figure 2). 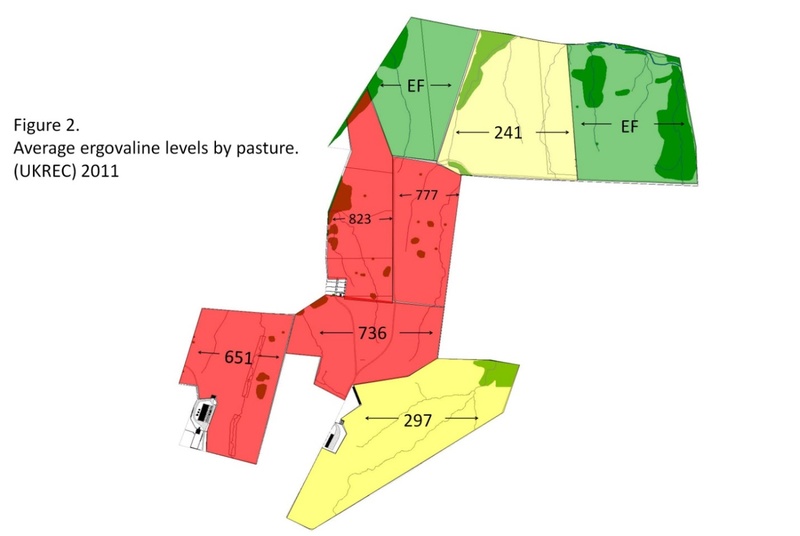 That information could make it possible to avoid the “hot” pastures during the summer months. The trial in Table 1 was conducted in the “hot” pasture (unbeknown to us). The two yellow pastures are high endophyte but always gave better than expected results in past years. The ergovaline levels can explain a lot. Armed with this information, we would prefer to be in the yellow areas during heat stress and breeding. There are several other keys to a successful breeding season. Obviously, fertile bulls are extremely important and breeding soundness evaluations (BSE) are essential. Think fertile bulls and cycling cows! A complete mineral supplement needs to be available on a year-round basis. If artificial insemination (AI) is used, that brings on the need for managing the details of AI and estrous synchronization protocols. In the short run, don’t let cows lose condition as the breeding season nears. Lush, watery grass might not support regaining condition after calving, peak milk production and rapid re-breeding. Do whatever it takes to get ‘em bred and bred early!